, have fun and be part of something big. Be a WikiLeaks Party volunteer. Our party’s campaigns depend on you. Instead of the slick, expensive ad campaigns of the majors, our volunteers spread the word online, on the street, at the pub, on polling days; any time and everywhere! Check out our amazing resources and if you are unsure about what you can do to help in the run up to elections, check out our guide on campaigning. Out and about? Use our mobile device toolkit to quickly access and share information about the WikiLeaks Party, sign up to help on polling days or donate. Complete your details below to volunteer handing out How-to-Vote cards on April 5 in Western Australia. Did you hand out how to vote cards in 2013? Are you available to attend prepoll booths during business hours prior to the election? Do you want to choose which booth you volunteer at on April 5? Use the search box on the right to find a booth in your area and then click on the booth name to confirm the selection. 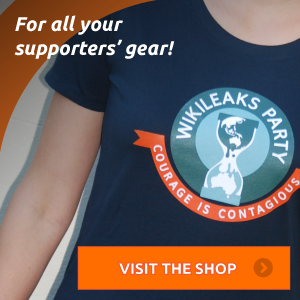 There are many creative and interesting ways you can get the word out there that the WikiLeaks Party has arrived on the Australian political scene before polling day, too. Here are just a few ways you can tell your friends, family, neighbours and work colleagues about the WikiLeaks Party. Make sure you check out our talking points to help you get conversations going, and also check out our platforms for more detail. Let us know what you plan to do (see the contact form at the bottom). Stalls: A chance to get out to local events, festivals and markets with flyers and information to let people know we are here – and why you are so proud to be involved the movement for transparency, accountability and justice. Make sure you check with the festival/market organisers before rocking up. Check out this stalls checklist. 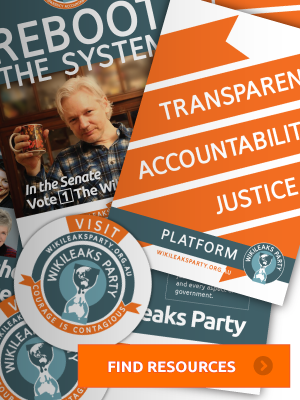 A stall is one of the best ways to tell more people about the WikiLeaks Party and our election campaign. It is also a great way for you to help us recruit volunteers and raise money. Plan your stall in advance to make it as effective as possible. • Do you need to book a space or get permission? • Do you need to bring your own table, chairs, marquee? • Who is going to run the stall? • Will you run it for an hour at lunchtimes, or will you run it over a whole day, or week. • Organise a rota of people to help out and make sure there are two or three people on at any one time. This way you can help each other, it’s more fun, and you are covered if someone is late or forgets to turn up. o use toolkit the to sign volunteers up instantly! o The toolkit can also help us fundraise by facilitating online shopping for merchandise! o Access the any information, via our website, that you are not 100% sure about – you don’t have to know EVERYTHING – leave that to the candidates! Letterboxing: A great opportunity to combine your exercise with political campaigning! Print out one of the great flyers below. Resources: flyers or in black and white. You can also order 500 delivered to your doorstep via our online shop. Flyering: Why not spend a few hours at your local train station (peak hour times are best) or shopping precinct handing out our flyers. Make sure you stand in public areas outside of the train station to avoid any problems. Print out some of these flyers and help get the word out! Resources: flyers or in black and white. You can also order 500 delivered to your doorstep via our online shop.